I just got off a zoom call with a group who participated in one of my recent 2 day Strategy, Engagement and Communications MasterClasses - and what they are telling me in terms how they are applying the new tools and skills they learnt really makes my heart sing. From day one all were able to apply learnings, get cut through on campaigns, build a substantial business case for new programs and initiatives, gain greater engagement with senior leaders and improve innovation, with one young sustainability co-ordinator even receiving a promotion for taking a greater leadership role. Having precedence and evidence of what others are doing - really makes a difference and takes the risk out of decision making. I am sharing this, as all the content I share in my 2 day MasterClass is part of the content I'm delivering here in my 5 day Leadership Program on Fraser Island. And of cause here's a whole lot of other additional gems and masterpieces you also get to explore - so, if have an interest in or responsibility for business transformation, improvement, strategy, innovation, leadership or communications and want to learn new skills, understand how to motivate and engage stakeholders, develop or promote green products / services or LEAD your business or community to improve their economic, social and environmental performance - then this program is for you. I know it's not easy to take 5 days out of your busy schedule, but if you invest the time, I guarantee it will start to payback immediately - providing confidence, better decision making, clarity of vision, ease of stakeholder engagement and so much more, to fast track your goals. It will also help you connect more strongly with your own intuition and guidance - which is why we are immersed in nature and give you the chance to swim with the most majestic creature on earth - the Humpback Whale. The collective experiences will be transformative - and you get to take home extraordinary memories, a new brains trust and an extensive tool kit to support your journey. Come join me Monday 3rd - Friday 7th September @ Kingfisher Bay Resort and Hotel, Fraser Island, Queensland. And of cause feel free to come early or leave a few days later to really soak up the warmth, the learnings, a new found confidence and enthusiasm for the job at hand. If you book and pay by this Friday June 22, you can also save $400 via our Early Bird offer: $4,050 twin share / $4,450 single supplement. Regular Price: $4,450 twin share $4,850 single supplement. 50% deposit upon booking with the balance paid in full by Friday July 20. 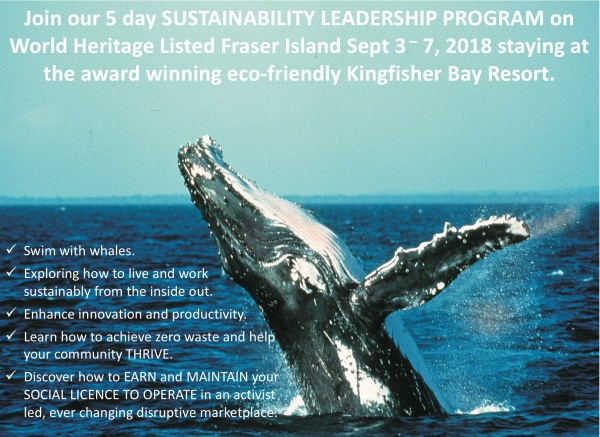 Price includes: GST, all meals (including a 5 course Australian Bush Foods degustation experience and accompanying beer/wine), 4 nights accommodation, ferry transfers to and from Hervey Bay, whale watching and swim, 5 day leadership program, workbook, online resource and checklists. Benefits: You will feel transformed with a robust roadmap to guide your journey - so you can immediately increase revenues and get greater uptake of your programs. We don't know what we don't know - so come discover what's new in the world to sustain, grow and transform how you operate and are seen in the world. For more information - download the brochure HERE. Take time out to work on your business not in your business, learn from global leaders, nature and your peers in what will truly be one of the best sustainability leadership, strategy and communications workshops ever hosted in Australia. To maximise learning outcomes, this program is for 12 only participants. Do not delay, book or reserve your spot today to take advantage of the early bird savings. About MOSS: Models of Success and Sustainability (MOSS) is an Australian based industry body for Corporate Social Responsibility and Sustainability. For more than 10 yeas, MOSS has supported business, government, academia and community organisations through education, training, networking, tools and advice to drive sustainability and competitive business success. We are led by systems thinking, and inspired by the Blue and Circular Economy and advocates for Project Drawdown. For more information refer moss.org.au or call us on +61 3 987 99 886. Privacy: MOSS does not endorse unsolicited e-mail, nor do we sell our e-mail address list. To unsubscribe from future newsletters and invitations simply respond to this email and write unsubscribe in the subject header. If you have been forwarded this invitation from a friend and would like to subscribe and receive our free bi-monthly newsletter or event invitations please provide your contact details here and you will be added to the mailing list.